Millstream Farm is a premier trout fly-fishing resort on the Mpumalanga Highveld near the well-known tourism destination of Dullstroom. Its scenic beauty is enhanced by an abundance of bird life, wild flowers and game. These can be enjoyed on nature walks or from horseback with staff who are passionate about nature conservation and the plight of threatened species in the area. This includes all three of South Africa’s crane species which call the Steenkampsberg home. Cranes have a magical ability to instil awe in humans and have been doing so for centuries. Around the world their spectacular dances and haunting calls have made them important symbols: of joy and the celebration of life to the Greeks and Romans, of happiness and eternal youth across Asia, longevity in Japan, and of royalty in South Africa. It is an ironic commentary on modern civilisation that all 15 crane species are threatened, including our iconic national bird, the Blue Crane. To save our cranes we need to save their wetland and grassland habitats. Towards this cause, Millstream initiated the foundation of the Highlands Crane Group in 1991. It was registered as a project under the EWT and the first field worker started work in the area in mid-1994. In 1995, several people dedicated to crane conservation formed the South African Crane Working Group under the EWT banner, including the Highlands Crane Group as part of the larger national programme. In the 1990s, cranes and their habitat were under threat from certain farming practices, in particular the use of poisons, and the impact of wetlands being turned into dams for the burgeoning trout-fishing industry. Interacting with local farmers to build awareness of the plight of the cranes created a heightened sensitisation to their conservation. This lead to actions such as better poison use and the marking of power lines to improve their visibility to birds in order to avoid collisions and associated mortalities. This ensured that the Steenkampsberg continued to be a provincial stronghold for all three our crane species. During the past decade the threat of large-scale habitat loss due to mining put years of conservation success in the area at risk. Through the good long-term relationships built with local land owners, the EWT, in partnership with Mpumalanga Tourism and Parks Agency (MTPA) and BirdLife South Africa, worked together to declare the Greater Lakenvlei Protected Environment (GLPE) in 2017. This area is situated between Belfast and Dullstroom and includes the beautiful Lakenvlei wetland complex. The Protected Environment status allows the current land-uses – mainly livestock farming and tourism – to continue hand-in-hand with sustainable conservation practices while limiting the possibility of mining in the area. It is hoped that the GLPE will be expanded in the future to include a larger area, including Millstream Farm. 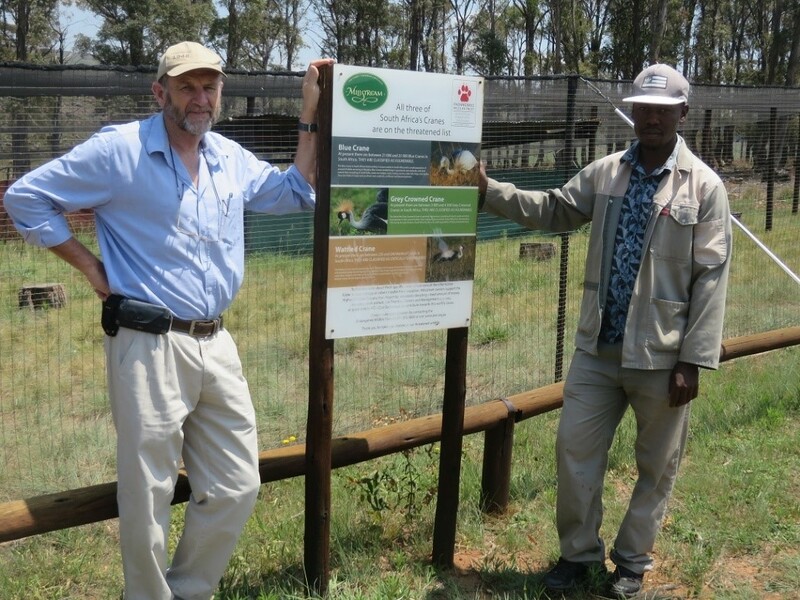 Millstream has funded crane conservation efforts on the Steenkampsberg from the inception of the project through to the present – an incredible commitment. They also have a pair of captive Grey Crowned Cranes, which is a highlight with visitors and supports crane conservation awareness. This year we are excited to work more closely with them by assisting the Millstream conservation officer with a new environmental awareness outreach project to township schools in Dullstroom and with the establishment of a vegetable garden for workers living on the farm. Much has been achieved over the past 27 years, may we continue to together conserve the Highland cranes and their habitat.